This was a talk that I gave last week at Ladies’ Night at our church. I thought I’d put my notes together and write it down…I’ll have to do it in sections because it looks much longer written than it sounded spoken! If you heard the talk, you’ll see that I am leaving out several sections of it because it just gets too long written out. Sorry! Women of faith encounter real problems. Rahab is an excellent example of that fact! She faced many problems in her life, serious problems that threatened many aspects of her life. The best way to learn about those problems is to read them right out of the Bible…You’ll find it in the book of Joshua, chapter two. The first problem here is clear: Rahab was a prostitute. That’s not the first career choice you’d think of for a heroine of the Bible! In fact it’s not a career choice we’d like to think of at all. Yet here it is, undeniable: Rahab was a prostitute. She lived in a city that put its faith in a terrible religion that worshipped gods who demanded human sacrifice and religious prostitution, which might even be why Rahab was what she was. Whatever the case, we can be sure that she was living a sinful, painful, lowly life at the time the spies showed up in Jericho. The second problem Rahab faced was this: She lived on the wrong side of the tracks. 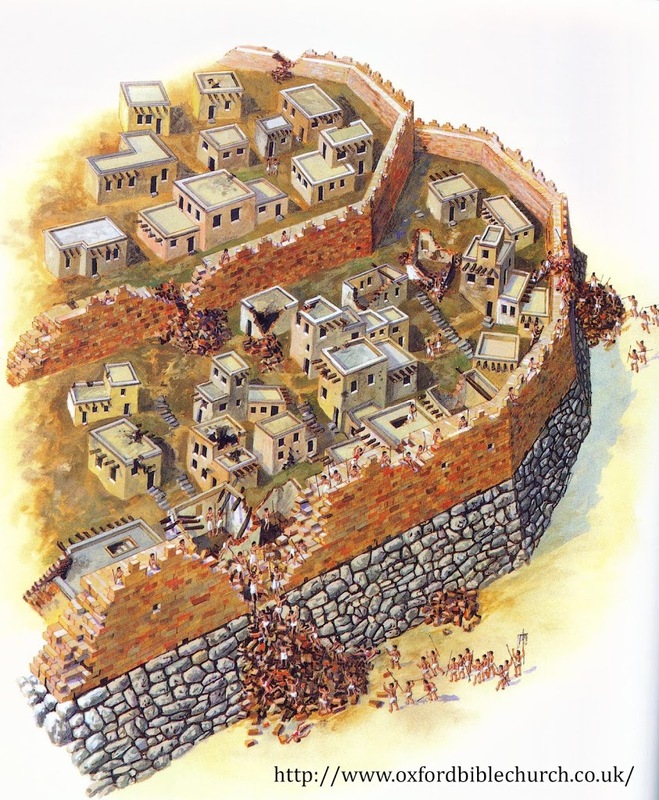 You see, Jericho had two walls around it, an inner wall and an outer wall. This left an area between the two walls, sort of a no-man’s land where houses were built here and there, sometimes (as in Rahab’s case) even using the existing outer wall as part of the house to save on construction materials. This was not prime real estate. The houses in this area would have fallen first to any invading army, and people with no money and no status would have lived here. There between the walls, Rahab lived with no hope of improvement, trapped in a life of sin and despair. On top of that, she faced a third problem: The city of Jericho was in great peril! Everyone had heard of the Hebrew people and what had happened in their flight from Egypt. Word had spread far and wide that their God was powerful, and had done amazing things to rescue His people. Remember, Rahab told the spies that the people were afraid…in fact she used the words “Melting in fear” twice when she described what was happening in the city! It’s important to know that Jericho was a fortress city, designed to withstand attack and siege. First, there was a slippery glaicis around the city, an embankment that would not have been easy to climb up. Then, they had the tall, thick double-walls protecting it. Within the inner walls there was a very deep well, which would have provided plenty of water in case of siege for an indefinite amount of time. In addition to this, the Bible says that all of this was happening at the time of the Spring Harvest (see Joshua 3:15). This means that they had just brought in all the grain from the fields! They would have had plenty of food, likely enough to last a full year in the case of a long siege. We know this is true from excavations at Jericho. Archaeologist found full jars of grain throughout the city…charred from the complete destruction that happened after the walls fell, but still full of blackened grain. So here was Jericho, surrounded by impenetrable walls, recently stocked from a fruitful harvest and able to withstand a lengthy siege. The Hebrews were a rag-tag bunch of strangers who had just come from the desert, where we can only assume they’d missed out on 40 years of the iron-age arms race. They shouldn’t have been a threat to a city of Jericho, and yet the people were melting in fear because of them. They had heard what the God of the Hebrew people had done, and they took that seriously. One wonders, then, if they knew the awesome power of God and had heard of the very real actions He had taken on behalf of His chosen people, why didn’t the city of Jericho simply submit to Him? Why didn’t they simply agree to give up the worthless, blood-thirsty gods of their own city and agree to worship the God who had mightily shown Himself to be true? They chose instead to stand against Him and be destroyed. I have no good answer to this question, but I do know this: Rahab alone chose to risk everything and follow God. A sinful woman, living on the outskirts of town, with no real worth and no real hope, was the only one willing to look at the facts and follow God. She chose to do this, despite the fact that the King of Jericho quickly found out that the spies had been to her house and sent officials there to confront her. Rahab was literally trapped between a rock and a hard place: Stuck there between the two walls of Jericho, with condemnation and death waiting within the inner walls (surely she would have been killed for helping the spies had the Hebrew army’s invasion failed!) and and an invading army backed by a powerful God preparing to invade the outer wall. This part of Rahab’s story reminds me of the parable Jesus gives us, about the man who found treasure in a field or the merchant who found a perfect pearl. This is how we should react when we find Truth! Often, however, that’s easier said than done. We can, even as seasoned Christians, ignore God’s call or forget about it. We sometimes, in fear or weakness, choose to run in the opposite direction when we feel God calling us to do something hard. Or, we can drop everything and risk it all! God loved Rahab despite who she was or what she’d done. She only had to respond to His call, and He called here right there in the middle of her sin. He found her right there, hidden and forgotten between the walls of Jericho. What will your response be to the call of a God of infinite power and incomprehensibly compassionate love? Thank you for this. You brought to light facts I didn’t know or simply had overlooked.